Since I live and fly out west, many of the flying sites consist of sandy beaches, soft dry washes and sand dunes. 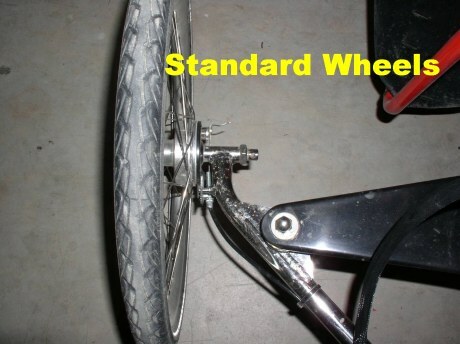 The standard Flyke rear wheels are only 1 1/2 inches wide and are not well suited for soft sandy launch areas. Even though I have seen Master Flykester Chris Bowles from Southern Skies effectively launch his flyke from a soft sandy beach, I thought it would be worthwhile to experiment with wider rear wheels. 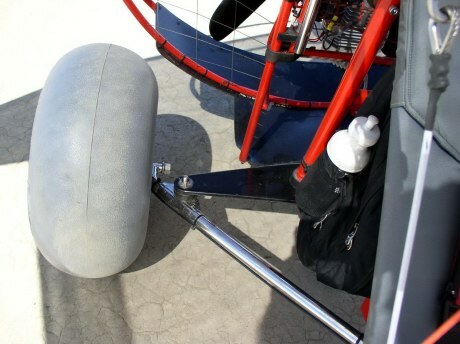 Hence, I have adapted and sucessfully flight tested a set of "monster" rear wheels for my Flyke. Launches, landings and touch and goes feel good. In flight I can feel a bit of extra drag and sluggishness due to their 9 inch width. However it was not that noticable and after a few minutes I forgot they were even on. Overall I am very happy to have a spare set of wheels adapted for soft launch areas and I think the monster wheels will open up some great new flying locations. 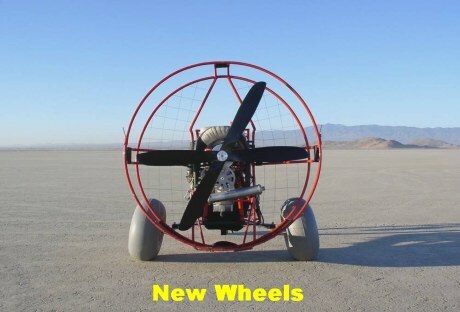 The "monster wheels" are made by Roleez http://www.roleez.com/ They are 49 cm in overall diameter and the axle height is only about 1/2 inch lower than the standard wheels. They are a full 9 inches wide and have a single bearing hub. The wheels sell for $99 a piece. A machinest charged me $50 to turn each axle down on a lathe. 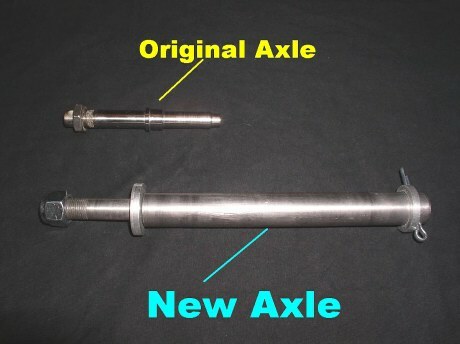 The axles are 11 1/2 inches overall length. The 3 1/4 inch long by 9/16 inch diameter (plus 1/1000" over) section fits into the Flyke frame and is secured with a 9/16 inch fine thread stuff nut. 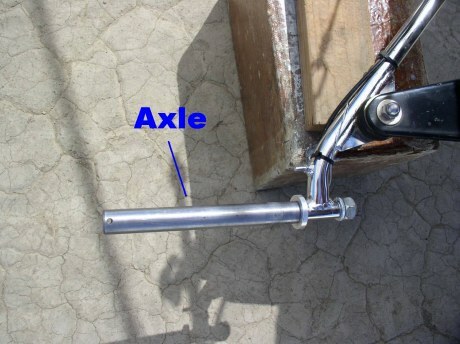 The 8 1/4 inch long 1 inch diameter section of the axle fits into the wheel hub and is secured with a cotter pin. 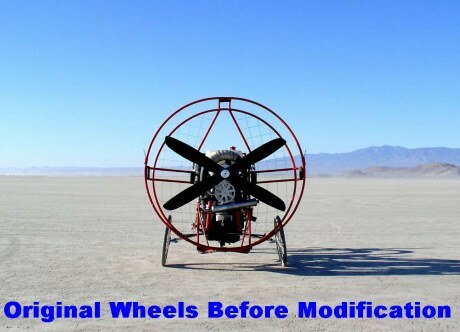 Before using the wheels it is recommended that the hubs be disassembled and the bearings be greased since they are shipped dry of any lubricant. The wheel bearings are not intended for sustained "go-carting" but appear to be more than adequate for normal launches and landings. 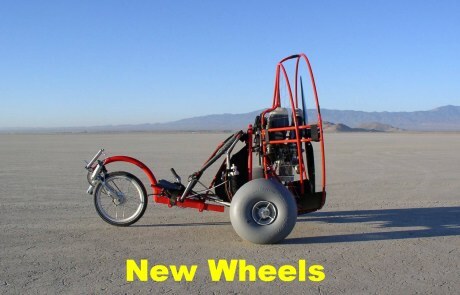 It takes less than five minutes to remove the standard wheels and install the monster wheels. 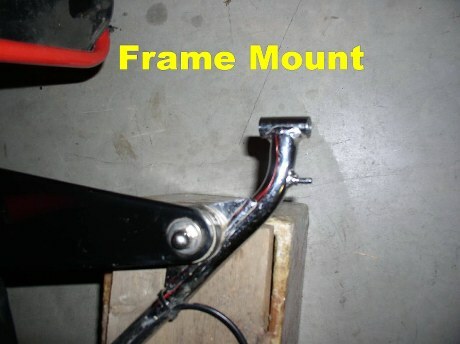 I have included a series of (11) photos showing the before and after rear view and some close ups of the wheel mount and axle. 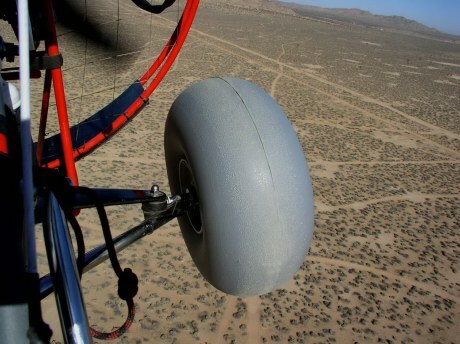 There is also a photo of the wheel taken during a flight over El Mirage Dry Lake.